J. van Tol, The Netherlands. 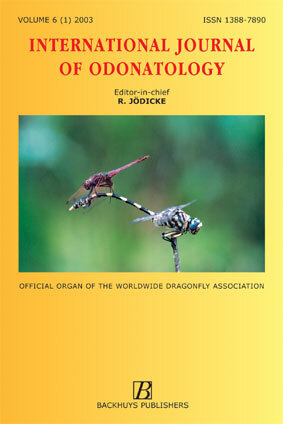 International Journal of Odonatology (IJO) is aimed at providing a publication outlet for the growing number of students of the Odonata. It will address subjects such as the ecology, ethology, physiology, genetics, taxonomy, phylogeny, and geographic distribution of species. Faunistics is eligible for publication in the notes section. Reviews will be by invitation, but authors who plan to write a review on a subject of interest to the journal are encouraged to contact the editor. Subscription price (2002) EURO 75.00/ US$ 71.75 (postage and handling are extra). RECENT ODONATA RECORDS FROM SOUTHERN FLORIDA - EFFECTS OF GLOBAL WARMING?